1. Preheat the oven to 220°C, gas mark 7. 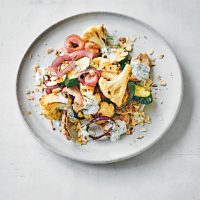 Heat the oil in a large frying pan and fry the cauliflower, courgette and onion for 10 minutes, turning frequently. Tip them into a large roasting tin. 2. Tear the pittas into bitesize pieces and scatter them into the tin with the cumin. Mix well. Bake for 15 minutes until the pitta is toasted. 3. Combine the yogurt, garlic and parsley with a little seasoning. Spoon the vegetables onto serving plates, drizzle with the yogurt and serve with the almonds scattered over the top. Cook’s tip To reduce preparation time, use a bag of frozen essential Waitrose Cauliflower Florets instead of the fresh and adjust the cooking time accordingly. 2 of your 5 a day; a source of fibre. This recipe was first published in Tue Jun 12 09:32:00 BST 2018.